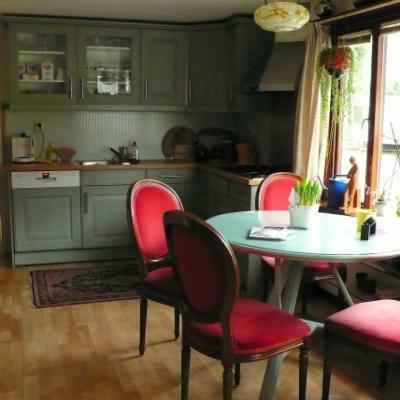 I offer a very nice house boat in the center of Amsterdam: A Large living room with open kitchen, including machine for the dishes, freezer, oven; Large bedroom with a bureau, extra tv. Nice bathroom with a shower and toilet; An extra bedroom with two single beds. About 75m2. The house boat is about 10 minutes walking distance from the newly opened Rijksmuseum; 15 minutes walking distance from the daily market Albert Cuyp Markt, 20 minutes walking distance from the flower market etc. If you don't like walking, there are a lot of trams to take just a few minutes walking away. The neighbourhood is called De Pijp, and is a very popular area to wine and dine, go to a pub etc. Still cosy too.